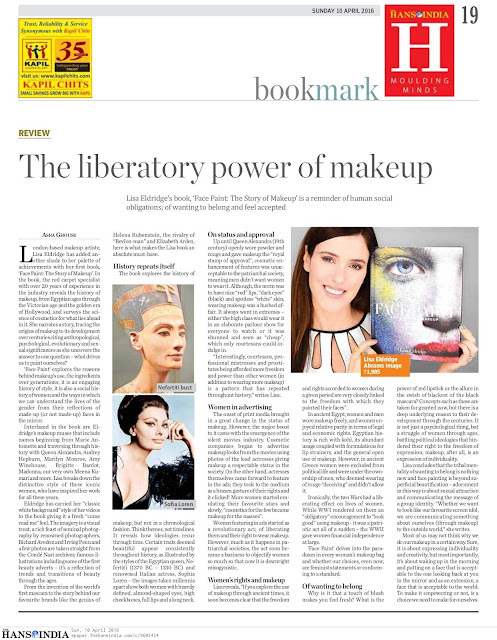 London-based makeup artiste, Lisa Eldridge has added another shade to her palette of achievements with her first book, ‘Face Paint: The Story of Makeup’. In ‘Face Paint’, the red carpet specialist with over 20 years of experience in the industry reveals the history of makeup, from Egyptian ages through the Victorian age and the golden era of Hollywood, and surveys the science of cosmetics for what lies ahead in it. She narrates a story tracing the origins of makeup to its development over centuries citing anthropological, psychological, evolutionary and sexual significances as she uncovers the answer for one question – what drives us to paint ourselves? The book explores the reasons behind makeup’s use, the ingredients over generations; it is an engaging history of style, it is also a social history of women and the ways in which we can understand the lives of the gender from their reflections of made-up (or not made up) faces in the mirror. 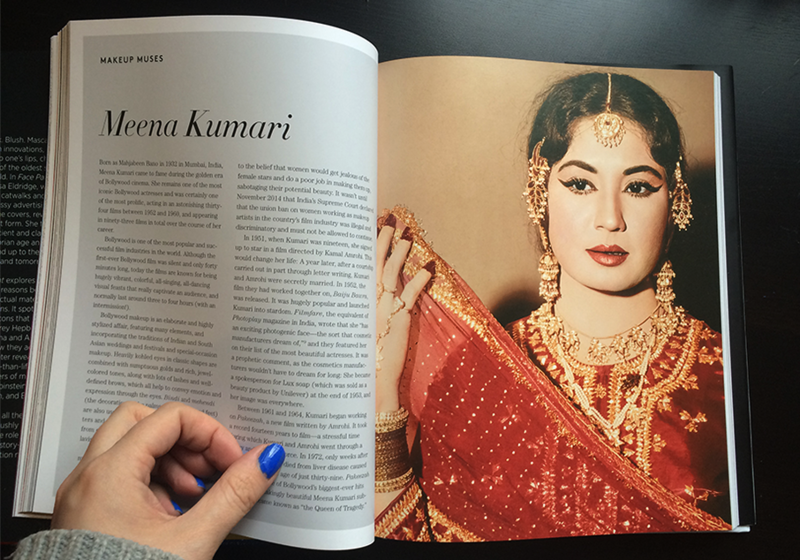 Interlaced in the book are Eldridge’s makeup muses that include names beginning from Marie Antoinette and traversing through history with Queen Alexandra, Audrey Hepburn, Marilyn Monroe, Amy Winehouse, Brigitte Bardot, Madonna, our very own Meena Kumari and more; Lisa breaks down the distinctive style of these iconic women who have inspired her work for all these years. We all know that Lisa loves the technology behind makeup. Her observations about the acceleration of cosmetology and textures in formulations of foundations, the magical weaves of a mascara wand and the power of a long lasting lipstick, gives you an idea of where things are going. 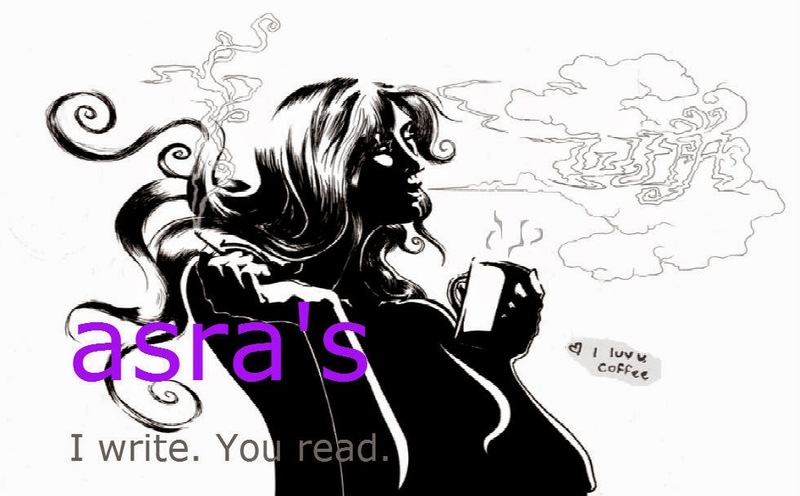 Eldridge has carried her “classic white background” style of her videos to the book giving it a fresh “come read me” feel. The imagery is a visual treat; a rich feast of seminal photography by renowned photographers, Richard Avedon and Irving Penn and a few photos taken straight from the Condé Nast archives; famous illustrations including some of the first beauty adverts – it’s a reflection of trends and transitions of beauty through the ages. From the invention of the world’s first mascara to the story behind the Helena Rubenstein genius, to the rivalry of “Revlon-man” and Elizabeth Arden, here is what makes the Lisa book an absolute must-have. 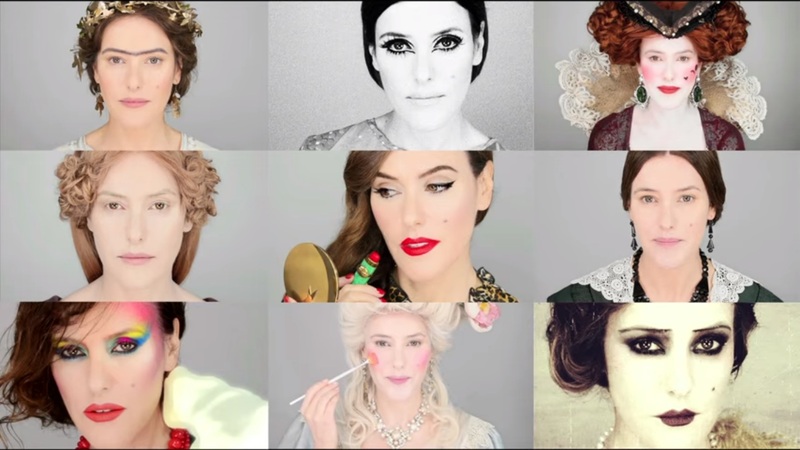 ‘Facepaint’ explores the history of makeup, but not in a chronological fashion. Think themes, not timelines. It reveals how ideologies recur through time. 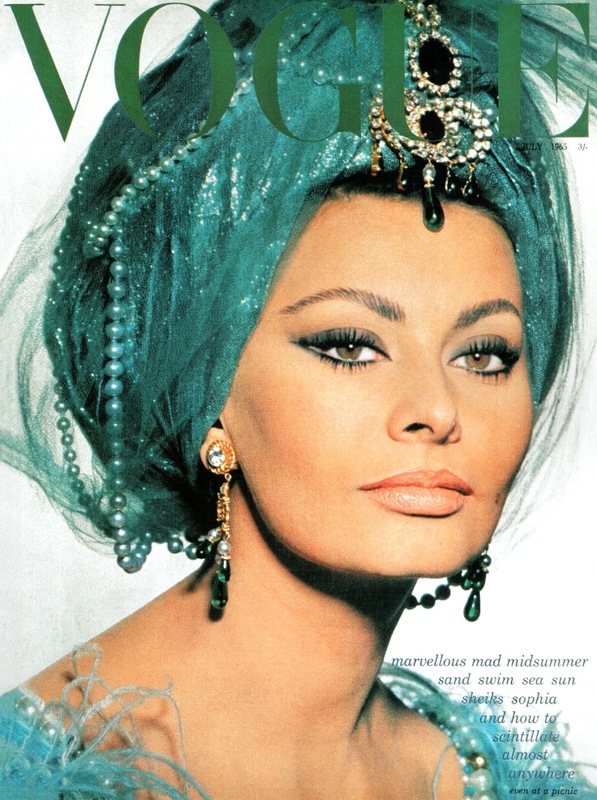 Certain traits deemed beautiful appear consistently throughout history, as illustrated by the styles of Egyptian queen, Nefertiti (1370 BC – 1330 BC) and renowned Italian actress, Sophia Loren – the images taken millennia apart show both women with heavily defined, almond-shaped eyes, high cheekbones, full lips and a long neck. The onset of print media brought in a great change in the status of makeup. However, the major boost to it came with the emergence of the silent movies industry. Cosmetic companies began to advertise makeup looks from the movies using photos of the lead actresses giving makeup a respectable status in the society. On the other hand, actresses themselves came forward to feature in the ads; they took to the medium as a brazen gesture of their rights and it clicked! More women started emulating their favourite stars and slowly, “cosmetics for the few became makeup for the masses”. 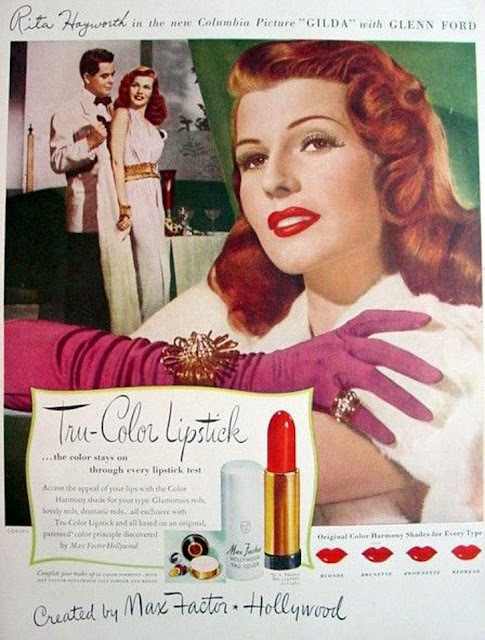 Association of Max Factor and Rita Hayworth for 'Gilda'. Also seen are lipstick shades for different hair types. Who identified skin types and sold skincare to suit? Did anyone actually like the man behind Revlon? Rivalry, revelations and rule breakers; they’re all in here. For instance - in Ancient Greece, around 800 BC, Athenian women mixed burned cork, antimony and soot to concoct a simple brow powder, used to thicken their arches and create the appearance of a unibrow. 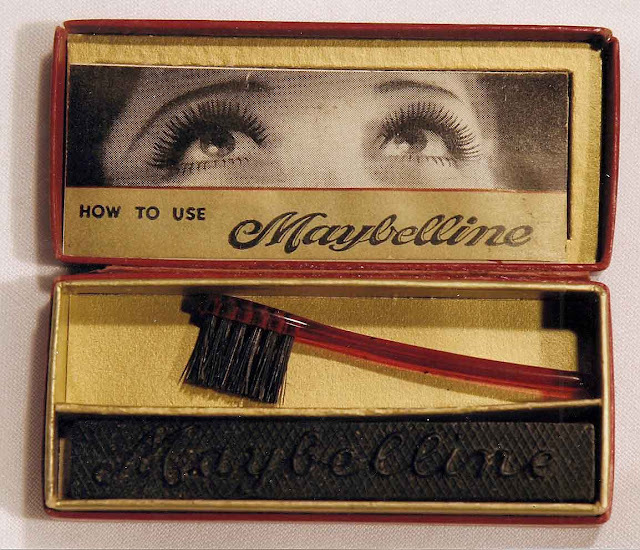 Centuries later, around 1917, TL Williams purportedly caught his sister Mabel mixing burned cork with petroleum jelly to darken her lashes, which inspired him to launch ‘Lash-Brow-Ine’—one of the first mascaras—and his iconic beauty company, Maybelline. 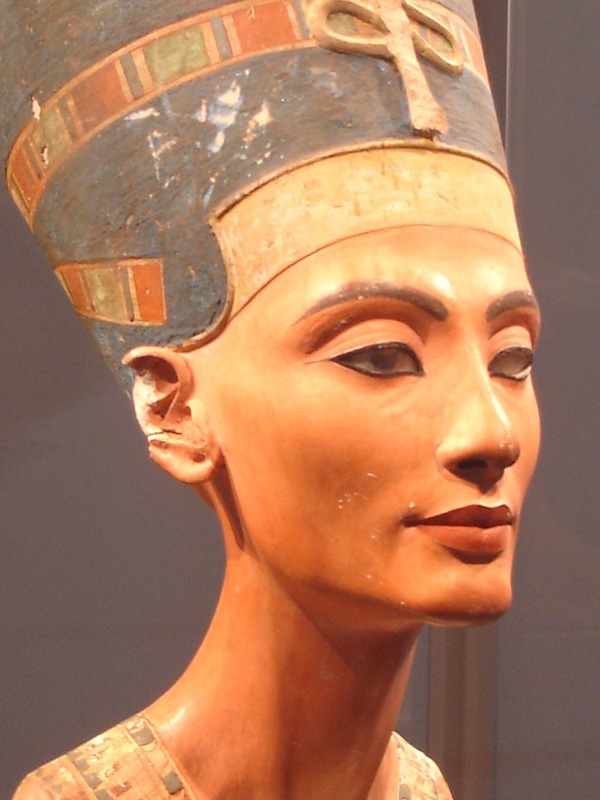 In ancient Egypt, women and men wore makeup freely, and women enjoyed relative parity in terms of legal and economic rights. Egyptian history is rich with kohl, its abundant usage coupled with formulations for lip strainers, and the general open use of makeup. However, in ancient Greece women were excluded from political life and were under the ownership of men, who deemed wearing of rouge “deceiving” and didn’t allow it. ‘Facepaint’ delves into the paradoxes in every woman’s makeup bag and whether our choices, even now, are feminist statements or conforming to a standard. Why is it that a touch of blush makes you feel fresh? What is the power of red lipstick or the allure in the swish of blackest of the black mascara? Concepts such as these are taken for granted now, but there is a deep underlying reason to their development through the centuries. It is not just a psychological thing, but a struggle of women through ages, battling political ideologies that hindered their right to the freedom of expression; makeup after all is an expression of individuality. Best and worst makeup across centuries. From a video on Lisa's YT channel.